ezTalks has a complete online meeting/webinar system. The products lines includes Meetings, Webinar, Rooms and Hardware to satisfy different customer requirements. This article is a Q&A comparison between ezTalks Meetings and Webinar. 1. 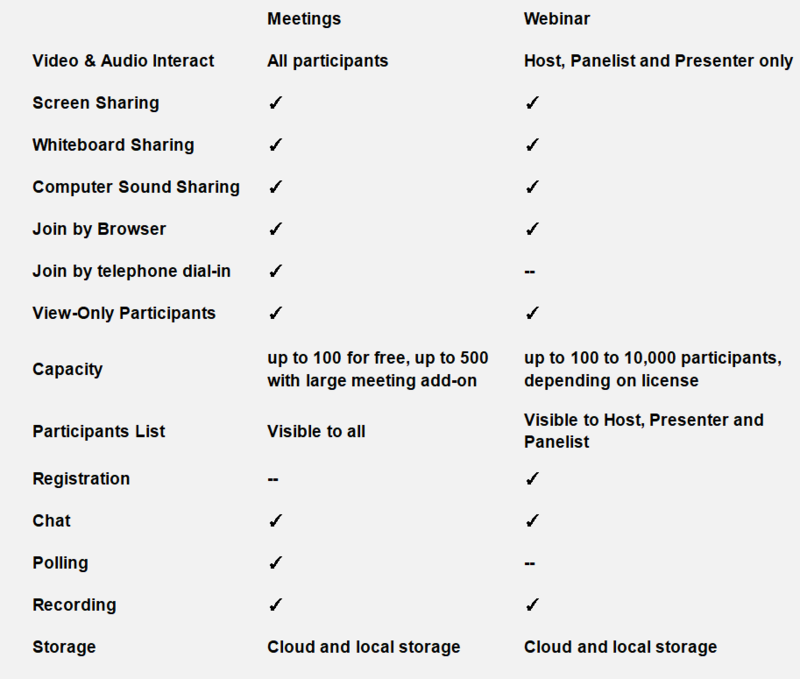 What are the differences between Meetings and Webinar? The Meetings is mostly for a collaborative event, which means all participants who join the meeting via ezTalks apps are able to interact, such as share screen & whiteboard, turn on their video & audio, etc. The Webinar is mostly for training, marketing, seminar and so on. Webinars allow view-only attendees, but they are able to interact via sending text messages. Moreover, the host can make some participants as the panelist and presenter, who can interact via video & audio, share screen & whiteboard via the ezTalks apps. It requires to install the ezTalks Rooms software on a PC in your conference room first, and install the ezTalks app on another PC or mobile device to control the room. Additional equipment can include TV displays, speakers, cameras, microphones to cover more than one people in a conference room. 3. Can I try Meetings, Webinar and Rooms for free? The Meetings has a starter plan, which is lifetime free to use though each meeting is limited to 40 minutes. The Webinar has a total 100-minute for free trial. You can buy the Webinar plan and it is highly recommended to practice it before your formal event. 4. How can I use the Meetings, Webinar or Rooms? 5. What are the prices for those plans? Please check the pricing and plans page.